This past weekend involved a lot of time on the water, and I’m happy to report that Lenny is going to be a fabulous boat dog! Part of the downsizing that we are doing right now involves getting rid of a vintage 1969 speedboat (any takers, by the way???). The thing is, until last week it was still in the process of being restored, and is only now running. We had to head up north to pick it up from the mechanic, and of course this involved a couple of test runs to see how things were. 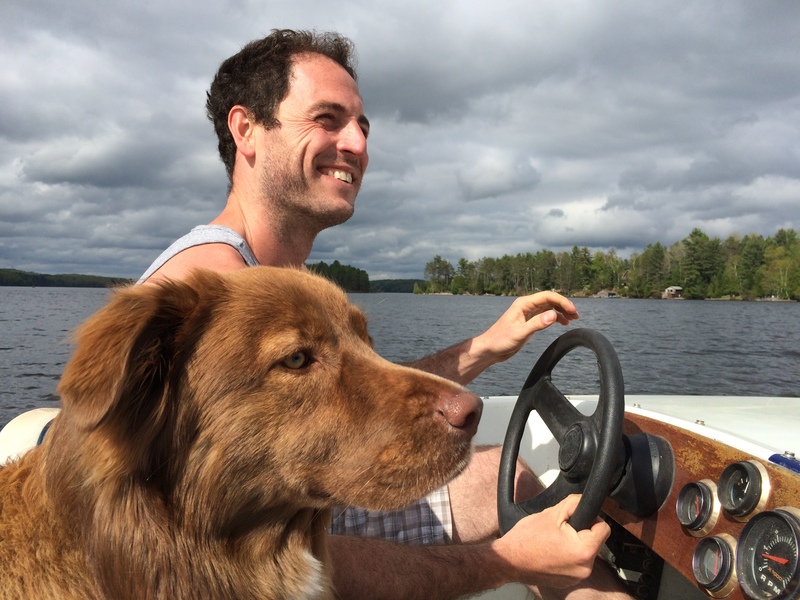 Now, a dog on a speedboat is much more precarious than a dog on a sailboat, but Lenny was in heaven! As you can see, he was right up front, helping to navigate! Part of the test run was on a larger lake with a couple of friends in their own boat (no one wants to break down all alone on Lake Simcoe). Again, Lenny had a blast going back and forth between the two boats, and keeping an eye on everyone to make sure we were all close by. 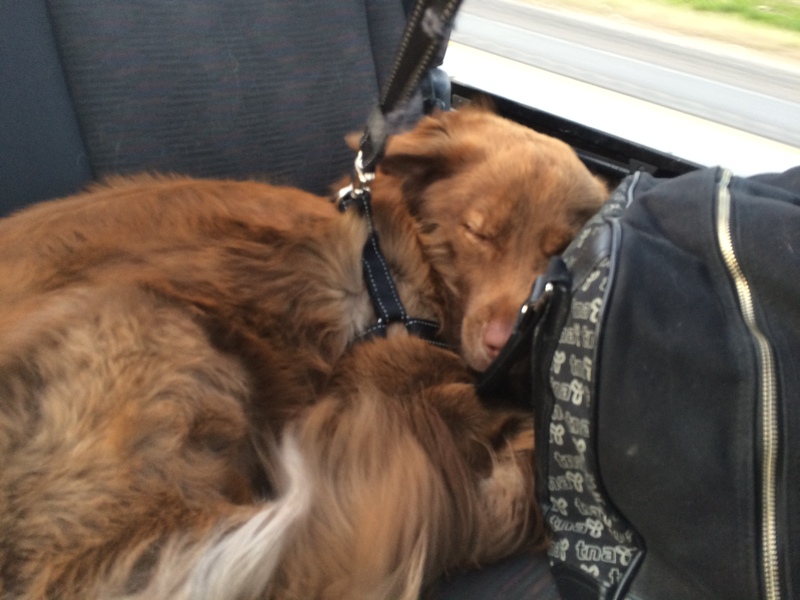 By the end of the day, he was so tuckered out he curled up in the back of the Jeep and slept the whole drive home. 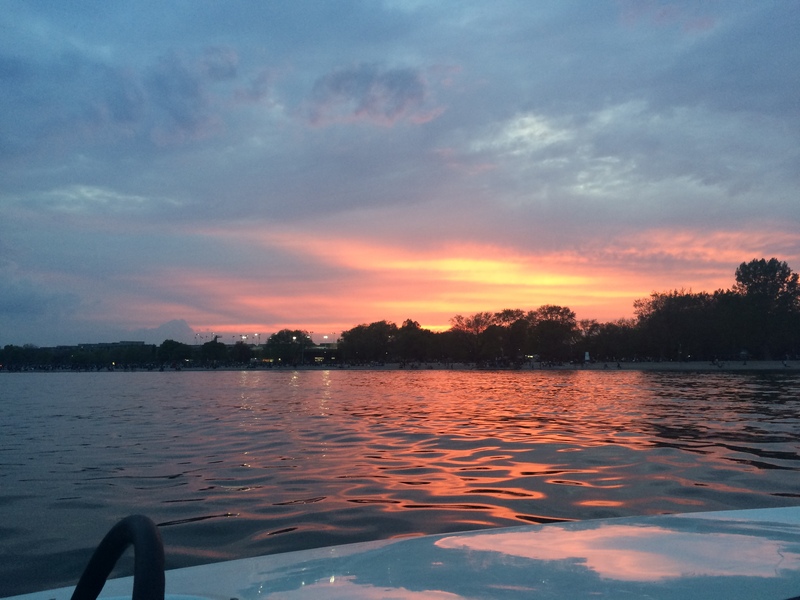 As for Alex and I – well, this weekend just confirmed how amazing it feels to be on the water. We finished up the weekend by watching the Victoria Day fireworks at Ashbridges Bay, but rather than sit on the beach with the crowd, we took the boat out and watched from the water. This entry was posted in Uncategorized and tagged anticipation, boats, celebration, dog, Leonard, peaceful. Bookmark the permalink. Argh! So exciting! I was thinking of you today! Glad to see you made it out (of course there had to be a Lenny event!). Look forward to following along!